Amazon the online book seller has forcibly deleted copies of George Orwell's 1984 and Animal Farm from customers' Kindles. The ebooks were pirated copies sold for 99 cents by a company that had no rights to the material. Amazon was able to remove the titles because the Kindle is configured to automatically sync up with the user's Bookshelf via the electronic book reader's WhisperNet wireless service. When the company removed the unauthorized books from customers' accounts, they also disappeared from the Kindle. We recently discovered a problem with a Kindle book that you have purchased. We have processed a refund to the payment method used to acquire this book. The next time the wireless is activated on your device, the problematic item will be removed. If you are not in a wireless coverage area, please connect your device to a computer using your USB cable and delete the file from the documents folder. Contrary to what the New York Times reported, the publisher did not change its mind, nor did Amazon cave to pressure. Rather, Amazon was notified that copyrighted material was being sold on the Amazon store without permission and it removed said material. Instead of being honest about what happened -- that it sold unauthorized ebooks and has done so in the past -- Amazon only told customers that there was a problem. While removing such titles from a customer's Bookshelf and in turn deleting them from the Kindle may be standard policy, a lack of communication about what actually happened has led to a media firestorm that will surely last through the weekend. Amazon also could have offered customers a legitimate replacement copy of 1984 or Animal Farm and footed the difference, because in the end, this was Amazon's mistake. Um sounds a nasty facility for censorship and control freakery has been built into Kindles. Surely it is only a matter of time before claims of libel or 'offence' will easily get Amazon reaching for their book burning button. Amazon surely were stupid, they have lowered the perceived worth of their products now customers know that books aren't really theirs at all and can be taken away without notice. In an apology posted on Amazon.com, company founder and CEO Jeff Bezos fell on his sword over his company's deletion of unauthorized e-books from the Kindles of consumers who had already purchased them. Borrowing a rather loaded word from President Barack Obama, Bezos termed his company's preemptive actions stupid ”— as well as thoughtless and painfully out of line with our principles. Amazon's actions last week kicked up a firestorm in the media about the nature of e-book ownership and the specter of censorship by Amazon. Bezos' announcement reads in full: This is an apology for the way we previously handled illegally sold copies of 1984 and other novels on Kindle. Our 'solution' to the problem was stupid, thoughtless, and painfully out of line with our principles. It is wholly self-inflicted, and we deserve the criticism we've received. We will use the scar tissue from this painful mistake to help make better decisions going forward, ones that match our mission. A school student is suing Amazon.com for deleting an e-book he purchased for his e-reader device without any prior warning. Justin Gawronski, 17, was left confused after a his copy of George Orwell's 1984 , which he was reading for a school assignment, disappeared from his Kindle reader. 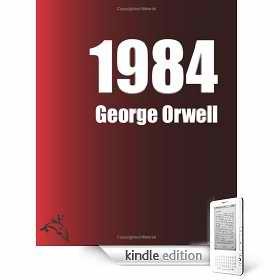 Both 1984 and Animal Farm were removed from customers' devices without warning or permission after Amazon realised the electronic copies were pirated. Lawyers on behalf of Michigan student Gawronski and Antoine Bruguier, an adult reader in Milpitas, California, have now filed a class action lawsuit against the online company. The case seeks unspecified damages for all buyers of e-books that Amazon deleted from the Kindle as well as a ban on future deletions. They argue that Amazon never disclosed to customers that it possessed the technological ability or right to remotely delete digital content purchased through the Kindle Store. Bruguier complained to Amazon repeatedly after losing his copy of 1984, appealing in vain for that or an authorized edition to be restored to his Kindle, according to the lawsuit. I thought that once purchased, the books were mine, he wrote. Jay Edelson, a Chicago lawyer who filed the lawsuit, said that Amazon's actions could have far-reaching consequences if allowed to stand: Amazon.com had no more right to hack into people's Kindles than its customers have the right to hack into Amazon's bank account to recover a mistaken overpayment. Technology companies increasingly feel that because they have the ability to access people's personal property, they have the right to do so. That is 100 per cent contrary to the laws of this country. After suffering multiple black eyes in the blogosphere and plenty of ire from Kindle users, Amazon has finally decided to make good on its ill-advised decision to delete illegally distributed copies of George Orwell's 1984 from users' Kindle e-reader devices. Those who purchased the book only to find it remotely deleted from their devices without warning will receive a digital copy of the book–with all their annotations still intact--or a $30 credit for Amazon products. Or they can just opt for a $30 check. Considering they paid just 99 cents for the book, it's not such a bad deal for customers. It has, however, been quite the ordeal for Amazon. Amazon founder and CEO Jeff Bezos offered the following apology to customers in an email sent to those affected by the mass deletion: This is an apology for the way we previously handled illegally sold copies of 1984 and other novels on Kindle. Our "solution" to the problem was stupid, thoughtless, and painfully out of line with our principles. It is wholly self-inflicted, and we deserve the criticism we've received. We will use the scar tissue from this painful mistake to help make better decisions going forward, ones that match our mission.